68 pages. 59 color/3 black and white reproductions. Hardcover with dust jacket. Please click below to purchase. Published on the occasion of the exhibition Retro, by Jenny Holzer. 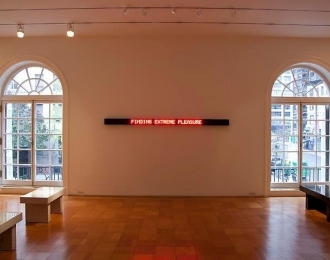 This exhibition is comprised of benches, plaques, painted signs, electronic LED signs and a Laments sarcophagus, covering a decade of Holzer’s oeuvre from the late 1970’s to the late 1980’s. It aims to reintroduce the diverse use of media comprising Holzer’s historically iconographic works, as well as explore the use of text and language throughout the artist’s early career.